One of the very first introductions to all things bird dog controversy a new bird dog owner will get is the great dispute over training bird dogs. I don’t mean which guru or which method. I mean whether you should train a bird dog at all. Some will indeed tell you emphatically that you don’t need to “train” (in the sense of teaching something) your bird dog, but rather that you should just take your dog out and simply let it do what it does naturally: hunt. That confused me a bit at first when I first heard someone express it to me. You mean that gorgeous, sustained bird dog point, a perfect stillness, hovering just under the explosion of release, betrayed only by pupils fully-dilated and a quivering canine excitement, the very thing that makes the hair on the back of my neck stand up - that doesn’t require training?! Well, that’s not correct, I soon found out. That most certainly does require training. Getting a bird dog first reliably staunch (where the dog won’t break point until the flush), or reliably steady to flush/wing (dog is steady through the flush, but might break at shot), or reliably steady to wing and shot (dog is steady on point through the flush and shot but might break when the shot bird is falling from the sky) or reliably steady to wing, shot, and fall (dog is steady through the whole drama until the handler gives the dog the okay / release to fetch and retrieve), well, that requires hours and hours and days and weeks and months, even years, even a lifetime of training. I soon came to realize that those who said you don’t train your bird dog are really talking about flushing dogs or pointing dogs that flash-point, then flush, all expressions of a dog’s inherited predation behavior that naturally emerge from bird exposure and which indeed don’t require training. And that’s all well and good. I don’t judge those whose passions are stoked from slightly different angles than my own in these or any other matters, and there are equally passionate flushing bird dog partisans and pointing dog partisans. Stereotypically (but I can think of so many exceptions), flushing dogs are favored by the young, those who scoff at notions of their own mortality and who enjoy running-and-gunning, and a fast and furious pace to pursuing their prey with their high-as-a-kite bird dogs at their side. Intellectually, at least, I can understand the appeal … for others. On the other hand, the stereotype (again, exceptions can be the rule!) of a pointing dog partisan is the older gentleman or lady, probably from old-money, whether he or she still has any of it or not after acquiring and maintaining a collection of bespoke English doubles (more expensive than some mortgages), as well-bred as her or his dogs, who prefers a slower, even meditative hunting pace, sipping expensive whiskey neat, jackets with shoulder patches, antique, restored, and well-maintained Land Cruisers, smoking a pipe, and fly-fishing, and those sorts of things. Stereotyped or not (hell, I check some - though certainly not all - of those boxes and especially don’t like to count age), I discovered, almost before I knew the difference, that I was of the latter variety. It all feels innate, maybe not unlike sexual orientation: baby, you’re just born this way - born to thrill at the sight of a finished pointing dog. In addition to a very strong aesthetic predilection to stand in awe at the blissful sight of a finished bird dog steady on point, another desire perhaps exceeds even that in my goal of getting Lincoln to a reliably finished state: his safety. It’s no secret that shooting birds is ironically my least favorite part of this whole endeavor of upland hunting. Time spent training Lincoln and making him happy (which includes very occasionally shooting birds for him!) are my favorite parts. But, I’d willingly sacrifice all of it to keep him safe. And the best way to keep your pointing dog safe and away from the danger inherent in charging prematurely into the line of fire of fallible human gunmen/women is to get the dog finished and steady to wing, shot, and fall so that the dog will not break for a retrieve until the handler gives the okay to release. As thrilling as our first hunt on loose birds was, you can see from this video the dangers inherent in only training a pointing dog to the point of being staunch. Steady to wing, shot, and fall would keep him from running into the line of fire and greatly increase his safety. We will not stop until we get there. From the rarefied aesthetics and romance of a finished dog on point to the safety his being finished affords my most cherished canine companion, there’s quite simply nothing I don’t like about a well-trained and finished pointing dog, or hunting over one, except possibly the enormous effort that goes into producing such a creature and such an experience. But, truth be told, on the other side of that very same coin, that’s actually very much part of the appeal too: lots and lots of daily and engaged quality time with your pup, at least for those of us who find ourselves in the finished pointing dog camp. 1) eschew a single send-your-dog-away trainer, and use some complex combination of a DVD or online system or books, and/or a mentor to bug to death, and/or a National Association of Versatile Hunting Dog Association (NAVHDA) group, the members of which mentor one another through the process and a series of testing. I’m sure there are plenty who have successfully trained a dog to the point of being finished using one or more of those methods. I myself have some of them in my own repertoire of training resources and knowledge. But I bet there are a hundred to a thousand times that number, whatever it is, who have started on one or more of those paths and who have given up before achieving their ultimate goal. 2) engage one trainer and just send your beloved pup away to him or her, in its latter months of puppyhood, but after you’ve bonded with it like a family member, for 3-5 months of boarding and training and stay awake nights worrying if it’s okay, wondering if it will remember you when it returns, wondering if the time away, not to mention the expense, is worth whatever skills it will possess upon return. Both options have their obvious draw-backs. The second option just wasn’t for us, first-time dog owners even at this early stage bereft by the idea of not having much more than a decade (or at the very most, two) with this deeply beloved new member of our family. We certainly weren’t going to give up consecutive months of the life with him that was already too short, not to mention the annual or semi-annual tune-ups back with the trainer that such an option usually demands. Alternately, the first option can leave a lot of holes in the process. All book and DVD options to date really still require participation in multiple workshops or seminars to really start to get a more realistic view of the full process and what you should do to correct the inevitable problems you encounter when you and your dog aren’t quite conforming to whatever step-by-step program you’re using. I can say that there are better and worse programs from my own review of most of them and I’ll save a comprehensive review of those options for later. They certainly added to my understanding of the overall task and the ways in which my chosen method differs from the others, an important ingredient in understanding what you’re doing. But, none seemed self-contained and solely capable of getting me, a first-timer dog owner and bird dog trainer in my mid-40s, all the way to where I wanted us to be. On the NAVHDA front, the nearest NAVHDA chapter to me was over an hour’s drive away. I did luck out with an exceptionally good mentor in the area, Chip Hidinger, whom I cold-called after seeing him featured in a short Project upland film and found out that he lived within a half hour of me. He turned me onto the West/Gibbons Steady with Style form of training which I’ve detailed in an earlier post, describing Mo Lindly’s annual seminar (hosted by Martha Greenlee and detailed in her book about Mo’s training methods), and which is the method of training that makes the most sense to me and fits most closely to what I want for Lincoln and for my relationship with him. But, even early on in my search, I felt there just had to be an option number 3. There had to be a way to regularly work with a professional trainer as a coach, someone who could help me train my dog and help me through the toughest parts, parts that might not be accessible for a first-timer (at least this first-timer) to pull off themselves on the long road to a finished bird dog. As I thought more about this, this coach would be a professional trainer who’d get to know my dog on a limited basis enough to coach me, but, more importantly, someone who would be able to explain what they’re doing and teach another human being (me) to do it. When I first met Grayson Guyer, of Lost Highway Kennels, at a snake-breaking clinic he did at Chip’s place last year, I had a good idea he might just be the sort of guy who could pull off something like what I had in mind. Immediately after putting a bunch of howling, yelping dogs through a searing experience to ensure they’d never in the future intentionally engage snakes that could easily injure or kill them, he was on the porch of Chip’s place talking about geeking out on B.F. Skinner’s Superstition in the Pigeon and other semi-esoteric works in the development of the discipline of animal training. A former active-duty Navy Corpsman, he described how he first got into training military dogs and how that led to his discovering his vocation of training all sorts of dogs, from bomb-detection dogs in Afghanistan, bird dogs, companion dogs, to protection dogs, diabetic alert dogs, and dogs serving indispensable roles in anti-poaching forces in Africa. And I knew: this was the dude. He was not just skilled in training canines, but pretty damn good at explaining it all to Homo sapiens, and in connecting dog training to the larger scientific disciplines to which it was related and drew upon - a truly rare set of complementary abilities. He counted West/Gibbons/Lindley Steady with Style methods as primary influences in his own training. And he lived an hour’s drive from my parents home in the south-west corner of the state - a great excuse to get down and see them more. It was all perfect, I just had to talk him into it! It turned out Grayson was very receptive to the idea, having already been thinking along the same lines himself in offering just such a service. He started coaching me via video-exchange, hearing more over phone calls about the challenges I was currently facing and then prescribing some exercises to fit that situation via a personalized video using his own dogs as examples. I’d then take what he was trying to demonstrate to me and make videos of my own to send back to him to let him see where we were and so he could both tell me what I was doing correctly and critique my performance where he saw the need for improvement or a change in approach. Dogs, like people, are just so incredibly individual. What works for some, or even most, certainly won’t work for all, and when paired with the individuality of a new owner/trainer, you just have an incredibly idiosyncratic partnership in the need of a professional to observe, diagnose, and prescribe. Those early exercises and efforts all paid off very handsomely. But, the most efficacious part of our experiment came when I was getting impatient at getting Lincoln past irregular staunchness on launcher pigeons to where I desperately wanted to get him before a new season started in the fall, which would be his first full season as a bird-dog: for him to truly be reliably staunch on his points. Grayson had a month-long trip to Namibia to work with InvictusK9, scheduled in the middle of the summer, but when he was set to return, Heather and I had several weeks of travel where we were already going to have to investigate boarding options. Perfect! Grayson and I agreed that while it would fall far short of the typical 3-5 months of finished bird dog training, perhaps the hurdles we were immediately facing in getting Lincoln to be reliably staunch could be addressed in that condensed span of time. We agreed that Lincoln would spend a month with Grayson training on staunchness and beginning forced retrieve work. This would all help Grayson learn Lincoln’s quirks so his coaching of me as his primary handler would be informed by that, setting me up for maximum success as I sought to maintain and expand upon the skills that Lincoln learned from Grayson during the month he spent with him. The whole thing WAY exceeded my expectations. In addition to getting Lincoln reliably staunch (arguably the most imposting / difficult hurdle on the way to a finished bird dog), and having the earliest and most frustrating part of the forced retrieve work established, fortune intervened to make the whole thing an even better experience for me and Heather. One of Grayson’s friends, Jimmy Cobb, an amateur turned pro photographer, visited the farm during Lincoln’s stay producing some incredible photographs of Grayson and Lincoln training together. Grayson and Cedar Ridge Farm owner, Seth Yowell, also just so happened to be planning during Lincoln’s stay a first attempt in offering an Upland 101 seminar in partnership with North Carolina Wildlife to introduce newbies like me to the sport of Upland Hunting, reinforcing and substantively adding to everything I had managed to learn in bits and pieces over the past couple of years. I just couldn’t have designed a better experience all around, for me or Lincoln. Heather and I were close enough to visit Lincoln a couple of times between trips, and were even able to have a little bird dog parents’ weekend during his time there, during which I attended the day-long Upland 101 seminar and Heather got to spoil Lincoln with a hotel stay and shopping excursion into Winston-Salem. Grayson and I continue to trade videos and occasional phone calls for him to coach me in everything we’ve been working to achieve since Lincoln’s stay. I’ve been able to move Lincoln along in morning yard work at heel significantly and in the forced retrieve process to the point that Lincoln is now reliably hunting for and retrieving bumpers in our alley every morning and in the field. He’s maintained the staunchness on point that he achieved with Grayson as I work to progress him forward toward being steady to flush and shot. Amidst all of our work together, I know I have a coach to call upon who knows both Lincoln’s and my own quirks enough to skillfully advise me. He knows I almost always need to hear that I need to be more patient with Lincoln and myself, that I shouldn’t rush all this, that “slow is smooth and smooth is fast” and he knows how ridiculously smart Lincoln is and is able to explain to me the ways such canine intelligence simultaneously bodes well for many aspects of Lincoln’s training but also means Lincoln has a lot of ways that he can outsmart me as a newbie trainer. At the end of the day, I know that my not just passing Lincoln off for several months to someone I trust like Grayson to take him all the way to being a finished bird dog means that it will take us many times that long to achieve the same results, and perhaps falling short of what an incredibly skilled and effective trainer like Grayson could achieve single-handedly in getting him to the point of being completely finished. But I wouldn’t trade this middle way training/coaching arrangement and method we’ve stumbled into for anything. I know for certain that having a coach who knows me and my dog has taken us much further than we’d already be and will continue to take us further and more quickly to the promised land of Lincoln being a finished bird dog than I’d be able to achieve on my own. For me, that’s the road-less-traveled path I’ve had to work so hard to discover for myself as needing and then had to work so hard to articulate and then had to work so hard to find a suitable professional coach capable of - and willing to - teach us in this way. Through some combination of the maximum amount of effort I’ve spent in pursuit of a training model not already available and ready-made, and in that pursuit stumbling into the benevolent serendipity of finding an arrangement, method, and a coach that has the fit and feel of a tailor-made glove, it’s hard not to sense the forces of some divine hand continuing to bring me along, responding to any efforts I’ve made with equal parts good fortune. Driven by some ancient but only recently unearthed impulse into what feels to me like some sort of bizarre second childhood, only to be met with the guidance of a rich inheritance of wisdom, passed down over generations of bird dog trainers, from masters to disciples, I feel like I’ve found the option number 3 that I was looking for but did not find easily laid out for me at the beginning, but which arrived just in time when Lincoln and I needed it to take our most important steps. 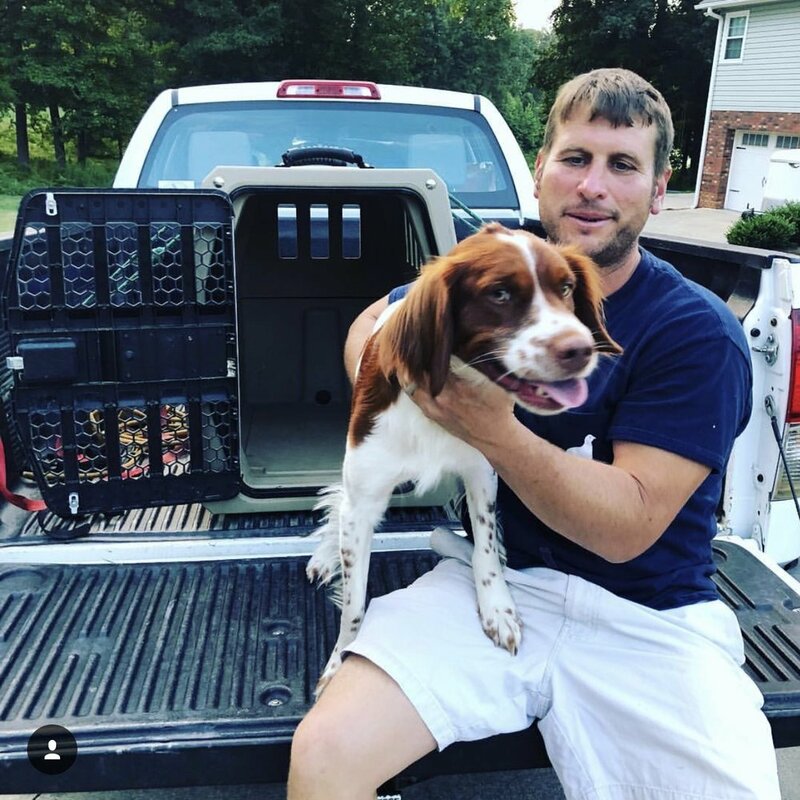 I have no idea why Grayson decided to name his training enterprise Lost Highway Kennels (a story I’m reminded that I need to ask for and hear), but this new - and often lost - bird dog handler and his bird dog found what we needed with him. If you’re following along somewhere behind us down the bird dog neophyte’s lost highway of birddogdom, be sure to look him up, tell him Lincoln and Robb sent you, and maybe you will too. Lincoln says thank you for signing up!